Ms. Magazine blocks ad on Israeli women leaders. Tell them what you think. Ms. Magazine has turned down an understated AJCongress advertisement that did nothing more controversial than call attention to the fact that women currently occupy three of the most significant positions of power in all three branches of the Israeli government -- judicial, legislative and executive. 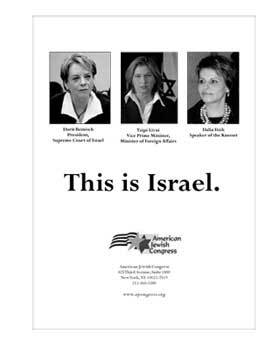 The proposed ad included a text that merely said, "This is Israel," under photographs of President of the Supreme Court Dorit Beinish, Vice Prime Minister and Minister for Foreign Affairs Tzipi Livni and Knesset Speaker Dalia Itzik. Ms. Magazine officials told AJCongress that publishing the ad "will set off a firestorm" and that "there are very strong opinions" on the subject the subject presumably being whether or not one can say anything positive about Israel. Ms. Magazine publisher Eleanor Smeal failed to respond to numerous calls by AJCongress President Richard S. Gordon over a period of two months. Ms. Magazine editors are now saying that they rejected the ad on the grounds that two of the three women are from the same political party. This is the lamest of excuses: in a parliamentary system, it is always likely that the foreign minister and the speaker of the Knesset will be from the same party. By the same token, if America elects a woman as president and Ms. pairs the new president in a photograph with Speaker of the House Nancy Pelosi to underscore just how profound a change it is that women dominate the executive and (half of the) legislative branches of government, would that betray a partisan political bias or a legitimate feminist bias? Now Ms. Editors and publishers need to hear from you. Register your compliant at their anti-Israel bias reflected in this decision to bar our ad by writing a letter, calling or emailing them. Tell them that their decision not to allow publication of an ad stating that Israel now has women at or near the top of all three branches of government, the judicial, the legislative and the executive, can only mean that Ms. has a distorted, anti-Israel bias. Publish an unbiased article about them instead. It would be in keeping with the original mission of Ms Magazine to feature these accomplished Israeli women in an article - perhaps one in a series of articles dealing with accomplished women in other countries as well. I hope MS. will consider this option. Ms. Magazine posture against Israel is hardly an innocuous event as some posts on here suggest. Rather it demonstrates the influence wielding by alien interests on American soil through an infiltration, indoctrination and usurpation strategy for which Ms. Magazine as a seemingly self-established icon of the women's "liberation" movement is but one vehicle. Recall it was on the backs of women that the United Nations held a women's international conference in Mexico City in 1975. At this conference was passed the infamous Zionism Equals Racism resolution. The infiltration and usurpation through seductive Communist Manifesto strategies in league with that of Islamic States mentored by the then Soviet Union targets all human rights interest groups, civil rights and women's rights leadership as well as American university campuses to install an agenda. Islamic hegemonic ambition over the Middle East, usurpation of American presence and influence on the part of the Soviets in Africa and the Middle East is partnered in the Marxist/Islamic axis. Ms. Magazine is part of its infrastructure edifice based in America. That light is cast on the reality of the women's "liberation" movement and whom it has come to serve is a step - one hopes - to understanding the reality of our times. And the necessity of standing up to such manifestation with the strength that comes from knowing and acknowledging the truth. You have to straighten out your act. I am amazed how organizations lose the original goals and aims of their establishment. I understand that one of the original goals of your magazine is to promote the success of women in all parts of the world. You want to project the notion that this is not just a man'world but women have an equal opportunity in making this world a better place to live in. What has happend in your refusal to discuss and publish the success of three Israeli women and there participation in their poliical life? I seems to me that your political views now supercede your original goals of promoting the success of women all over the world. What really matters is not where they live but to show how these women succeeded in their societies. These women could certainly be an inspiration to other women to reach important positions in life. Is there really a bias against Israel that your magazine refused to present these women in any way? Would the magazine also refuse the success of women in China or other places where women aren't allowed to express themselves in public life? I am sure that I will not get any response from you. Perhaps what I write will give you a moment to reflect on the original aims of your magazine Are you functioning towards those aims? Israel has lots of enemies in the world--real enemies. I doubt Ms. magazine is not one of them. Its decision not to print this ad only hurts the magazine's cause, because the ad is benign. But it doesn't qualify as anti-Israel or, worse, anti-Semitic. Keep throwing around those phrases like they mean nothing, and pretty soon people will forget what they really mean. This article is purely for reactionaries, not rational thinkers. Ms. magazine made a bad decision. But is this really that big a deal? I'm not writing. I'll save my energy for Israel's real enemies. Notice how not one comment here was from someone who actually reads Ms. magazine and says the ad is perfectly in keeping with others in the magazine. Ruth, I appreciate your view, as this is sometimes true. However, in this case, the actions of Ms. are truly despicable, and there is more than a shade of political undertone that has no place in such a magazine. Yes, the magazine was founded on worthy principles, and this rejection of Israeli women was truly contrary to their mission. What was inflammatory was a rejection of such an ad, not the shocked reaction to the rejection. So you have a point, but I think in thic case, the anti Israel/political sentiment is all too well identified. Ms. Magazine's decision is anti-Israel bias, but let's not forget that these women DO NOT represent Jewish women at all. The Jewish women heros are mothers and grandmothers who instill real Jewish values in their children by providing for them a warm home to insulate them against the tidal wave of secular glamor--the types the women in the photo represent. Real Jewish women work long,hard hours caring for their families and constantly pray for the welfare of their children. Hi, there's an article on this topic in the Globe, Nation A11. Ms does give reasons for rejecting this ad and, perhaps, if one analyzes the Ms Mission, these reasons are not inflammatory and are part of policy. I would be willing to think this and not to fan the flames, creating bad feeling about a magazine that, historically, promotes women and is most supportive of all women in all places. Sometimes I think we are too too sensitive about many issues and fan the flames when we should be more circumspect. It's very easy to get worked up and histrionic about issues affecting us and it's very easy to feel offended, particularly if we have been sensitized by history. But honestly, I have a feeling this misunderstanding, on both sides, can still be cleared, leaving good feelings all around and not boycotts and rejections of a truly good-hearted magazine. Ms Magazine's approach is reprehensible and needst to be condemned in strongest terms. It is shocking to note that Ms Magazine blocked a progressive developmen of women empowerment in Israel.All democratic countries should banish Ms magazine for stifling the spirit of democracy. You would think of all magazines MS would be rooting for these women and their achievements! Tis was an ad about woman in Israel in high positions. It had nothing to do with politics. Ms magazine should have realized that and enjoyed the pride in Israeli woman's achievements. Ms. actions negate original purpose of its publication. I can well remember when Ms. Magazine was first published and the reason for its existence. This latest debacle goes against everything for which Ms. was originally begun. This anti-Israel stand, translate anti-sematic, is totally unacceptable especially for such a magazine. I'm wondering if the publishers feel threatened by these three highly intelligent, competent women, because they truly are superior. By the way I am not Jewish, but I have a great deal of compassion and understanding of what the Jewish people have endured. As a Christian, I know that as Israel goes so goes the world, and we have all descended from Abraham. You need to rethink this decision. I am appalled that Ms. Magazine - a publication founded on ensuring that the rights of a significant portion of this country are respected - would blatantly disregard the rights of another group of people. I find it deeply saddening and hypocritical that, while they show great courage when fighting for women's causes, they turn tail and run when confronted by "a firestorm" of protest from obviously on antisemitic sources. I would like to know what kind of firestorm publishing this ad, which sounds innocuous enough, would, in the opinion of Ms, provoke? Now that's very curious and I think learning more about this would be very instructive. "You have the guts of an amoeba." We live in confused times when a women's magazine would reject an ad highlighting the achievement and prominence of three women in Israel's government and an educational message to broaden readers' awareness and perception of Israel as a progressive, modern nation with alot more to it than gets reported in usual media outlets. It is hard to see it any other way than political bias or worse cowardice on the part of Ms. magazine, to the point of undermining their very values, which I fully share and embrace on the place of women in our society and world! This magazine is in business to tell women what they should think, so why is it any worse to tell them that there is nothing good about Israeli women than to tell them that there is nothing good about Israeli women? Ironically, these are the three Israeli women most likely to make the question moot in a year or two, as they help preside over what one Israeli MK recently called "Olmert's going-out-of-business sale". And finally, if Ms Ragen is really concerned about the Israel's image, she might consider not attacking those who wish to ride on separate seating buses. Israel is a Jewish state, not a Leftist state or a Feminist state. I do not understand how Ms. Magazine can ignore the progress of feminism in Israel, which surpasses that of all other Middle Eastern countries and even many in Europe. To me it seems that Ms. should celebrate this fact, rather than cower at the mere belief that there is strong anti-Israel (i.e. latent anti-semitic) views among its readership. If you want that kind of readership, it says something very disturbing about the editors at Ms. I don't think much of these women - not because they are women, but their left wing politcal views are an anathma. Nevertheless, they are indeed prominent and I fail to understand why your feminine orientated magazine decides to apply a boycott, unless you are anti-semitic and anti-Israel. I used to read Ms Magazine regularly years ago, but then as American feminism became less relevant to my life, I left it behind. A couple of years ago I found a copy in a library and was disappointed to see its left-wing bias. A typical article might be about oppressed lesbian single mothers in some obscure Third World country. I could not relate at all. Now Ms.'s anti-Israel attitude is being shown loud and clear. Jewish women should protest immediately and state they will no longer be purchasing such a biased, hypocritical magazine. While this article may be making a valid statement, it seems to be playing more on the readers emotions, then outlining the issue at hand. Everything Israel and everything Jewish is not the same, and using anti-semitisim to bully people into doing things our way minimizes legitimate cases. The article does not say if Ms. Magazine asked for a different version of the ad for publishing, nor does it elaborate on the reasons for non-publication. I imagine that Ms. Magazine did not make this decision lightly considering that many major players in the entertainment industry and political sphere are in fact Jewish, which leads me to believe that there is more to the story then this article would indicate. I read the response from Ms. magazine, and you have missstated their position on this. I believe their actual explanation is relevant and they have highlighted Israeli women in other articles, so your bias charge is erroneous. At least five of us that I know of will no longer buy your magazine. Unless this is part of a series of ads "This is Israel" I think it'd make more sense to say instead something like "Where do you find women in Israel?" I agree with the sentiment of the original text, but honestly, these women are not Israel and Israel is more than women in high political offices. Oh this is disgusting! How about freedom of speech? What about an ad about women in Islam? How many positions of power they hold, and how many were murdered for trying? In India women are 6% of the government, France is a paltry 12% and ranks 86th place in the world. Even Uzbekistan is 62nd place! I did voice my dissapointment to Ms. hopefully enough people will write, and cancel subscriptions - I hope this gets out and casts a light on their poor editorial and management choices! Please, come up with a much better, a good excuse! Your decision not to allow publication of an ad stating that Israel now has women at or near the top of all three branches of government, the judicial, the legislative and the executive, can only mean that Ms. has a distorted, anti-Israel bias.